Oriental likes to welcome visitors. Those who come by boat can tie up for free for two days at the Oriental Town Dock. There’s also the free Oriental anchorage, which at the moment has no time limit. In recent years, some boat crews have dropped anchor for months on end. A few years ago, one boat stayed more than a year and a half. Its owner was hundreds of miles away as Hurricane Irene approached – the boat, a battering ram waiting to be deployed. Right now there are three long-termers. One boat is “stored” in the anchorage. Two live-aboards, meanwhile, have taken up residence there since the beginning of the year. In May, TownDock.net published a Letter to the Editor from a resident on the subject. It quoted a visiting cruiser who said he was leaving Oriental and not staying in the anchorage — because there were too many derelict boats there. A few days ago, Russell Easby-Smith contacted TownDock and said he was the boater quoted in that original letter. Russell’s lived on his boat for 10 years, and offers an outsider’s perspective that might spur more debate — and perhaps action by the Town — on the subject of unattended or derelict boats. If you want to welcome more boaters, he writes in this guest column, you need to limit how long they can stay. riental is not my town. I don’t live there, so I restrain myself when it comes to your local politics. I visit often, typically twice per year, in spring on my way south and in fall on my way north, as I have for a decade. I feel at home in Oriental and several locals know me by name. But the letter written by Gil Fontes which prompted me to write makes me think perhaps I shouldn’t be so quiet on local politics – perhaps the “Sailing Capital of North Carolina” would be interested in the perspective of a full-time cruiser who frequently passes through. Anchoring limits are a touchy subject with cruisers. Most of us have the all too recent memories of issues in Florida with anchoring bans which had to be fought (and won) in court. Time limits can often evoke fears that the next step is an outright ban. They evoke the idea that cruisers are unwelcome. 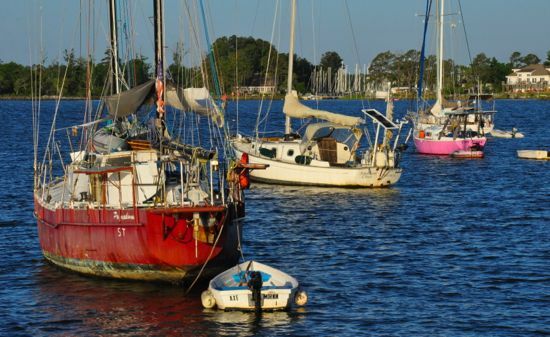 But, the flip side, as any ICW cruiser can tell you, is the sight in Georgetown South Carolina — an anchorage full of derelict boats that have not moved in years. I know many cruisers who will not even stop there because the anchorage is so full of these things. So, balance is key here. A favorite stop for many cruisers is Wrightsville Beach, but most don’t even know there is a 1-month anchoring limit there. Why don’t they know? Because it is reasonable and does not affect the vast majority of them. I should point out, though, that Wrightsville is a large anchorage and really does not need a time limit – just a “derelict rule”. Derelict rules mean to ensure that boats anchored are able to move under their own power (with reasonable time given for repairs and other circumstances). Basically, this keeps the floating shanty from filling up your anchorage (such as in Georgetown SC). But Oriental is different, the anchorage is small, tiny in fact. Many of us cruisers actually will drop the hook in Adams Creek and check the TownDock.net webcam for space on the Town Dock or room in the anchorage. It stinks to make it to Oriental after a long day on the water, only to find there is no room for you. I know many cruisers who totally bypass Oriental just because they know it is unlikely that they will find space. Some will stop in various marinas nearby, but end up not visiting town. For every cruiser you meet at the Bean, there are probably at least 20 who sailed right past. In my 10 years of cruising, without fail, each time I have visited Oriental, there is at least a couple of long-term boats anchored in the tiny harbor, taking up precious space. A few times even totally unattended ones, just left there. Three of the long-term boats in Oriental’s anchorage, Primadona, Southern Cross and The Shire as seen on Sunday morning. The fourth boat, in the distance, near the end of the breakwater, was a visiting vessel from Hawaii. While we cruisers tend to be skeptical of anchoring limits, in a town with such a limited anchorage as yours, I think most would find it very welcome to see a limit of 1 or 2 weeks imposed (with leniency for those making immediate repairs). Every long term “floating house” or “convenient place to store my boat” you ask to relocate to one of the many viable anchorages nearby (but not walking distance to the restaurants and downtown businesses) means several dozen more cruising boats per year, who will be spending money in your town and falling it love with it rather then bypassing it. If the anchorage was not so tiny it would not be an issue, but the limited room makes it a real problem. I am sorry to be long-winded, but it is not a simple subject from a cruiser’s perspective, as I am sure it is not from a locals’ perspective either. 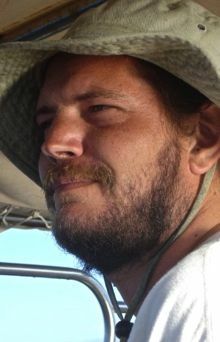 Russell Easby-Smith lives aboard the s/v Lady Pauline, a Cape Dory 36.